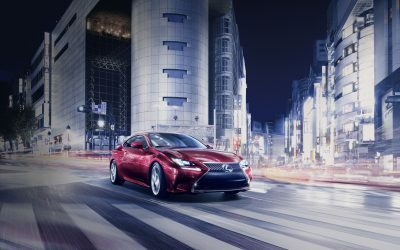 Two versions will be unveiled: the RC 350, with a 3.5L V6 engine; and the RC 300h hybrid, with a 2.5L four-cylinder engine — the full press release follows. Striking concept-to-reality coupe explores new frontiers for Lexus. High performance V6 gas and hybrid powertrains accentuate the strong sport-nature of RC. 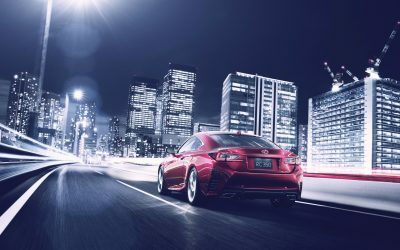 New Lexus dedicated coupe with the most aggressive use yet of the iconic spindle grille. The all-new Lexus RC coupe will make its world debut at the Tokyo Motor Show on Nov. 20,2013. The press conference will be held at 8:45 a.m. and a live webcast stream of the event will be available at http://www.lexus-int.com. Two RC models will be displayed at the Tokyo Motor Show – RC 350 with a 3.5-liter V6 engine, and the RC 300h hybrid with a 2.5-liter engine. Today Lexus released photos of the all-new RC in advance of the world premiere. The RC line brings to life the luxury marque’s focus on emotional appeal through a dynamic and alluring two-door coupe. It has been developed to raise the brand’s profile with a broader audience and new-to-Lexus customers. 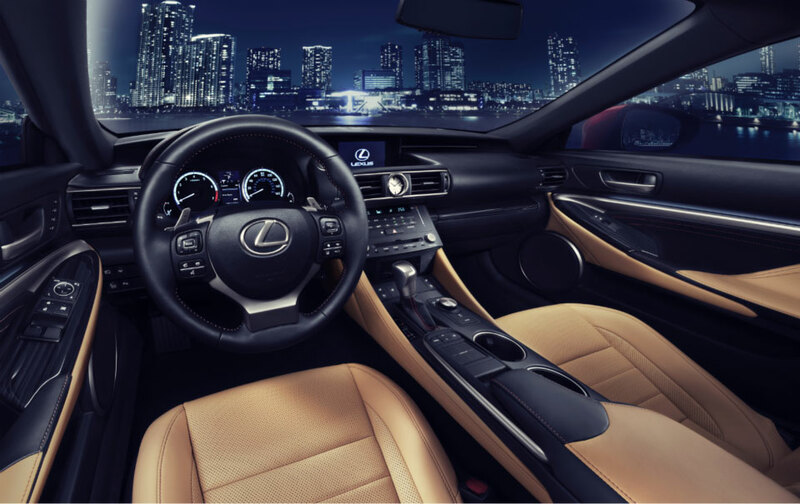 It injects emotional appeal into the Lexus DNA that is synonymous with build quality, refinement and reliability. Triangular headlamps evoke the sporty characteristics of the LF-LC styling while concept vehicle inspiration is evident in the unique three-lamp LED design. At low beam, the lamps adopt an L-shaped pattern as an expression of the Lexus identity. The sharp, thin design of the rear combination lamps adopts the symbolic Lexus L-shaped motif. 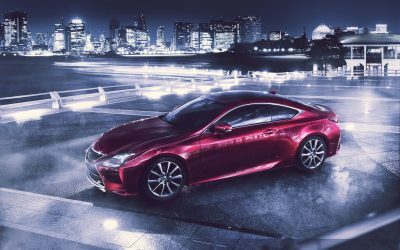 A new Lexus painting process that uses multiple layers of clear and deeper-colored coating brings the RC coupe to life with a brighter and more contrasting shade, especially on the racy red exterior. The RC measures 4,695mm long, 1,840mm wide and 1,395mm high, with a 2,730mm wheelbase. Highly acclaimed sport concept vehicles have greatly influenced the interior of the RC coupe, with maximum use of contrasting colors, materials and lighting. A purpose-built Lexus-first lighting package provides a great sense of occasion, with illumination that reflects upwards, rather than downwards, to envelop the interior. High contrast interior trim, including a new tone called Clove, emphasize design lines and accentuate the elegant cabin. Genuine shimamoku wood highlights – the result of an intense, layered wood production technique refined by Lexus – are used to emphasize the surrounding trim. Important for a coupe, the seats utilize an integrated foaming construction method – much like the molding of racing seats – to ensure optimum occupant comfort and support. Lexus will host a press conference at Tokyo motor show for the unveiling of the new RC at 00:45am GMT on 20 November. The event will also be broadcast in a live webstream at www.lexus-global.com.